I first met Nike Adesuyi at the University of Ibadan (U.I.) in the mid 1980s. I may not remember the exact occasion of meeting her but there was something magical about that meeting that I looked forward to seeing more of her. She was quiet in a loud kind of way; beautiful in a subdued fashion that called attention more to her being than to her appearance. Her unpretentious personality belied her crackling wit and shy imagination that crept out of their shells once she was comfortable enough to let her guards down with you as a friend. And I was fortunate to call her my friend, to have been up-close with her, and to have shared some significant chapters of our long, and as yet unwritten story, as undergraduate students at Unibadan’s Department of English. Nike was very much a girl, and some kind of feminist, but she was more “masculine” than some men whose claim to manhood rests on their restless crotches. She was, as the balladic R&B singer Lionel Ritchie would croon, “two-times a lady”. Not only was Nike the pillar of her family having lost her dad under mysterious circumstances. She was also a cornerstone of our male-dominated literary circle at U.I. those days called the Thursday Group, of which our dear lecturer and patron saint then, Harry Garuba, had formally introduced in the anthology, Voices from the Fringe (1988). And no one thought of her as a girl. We seemed to have been gender neutral, and would spend endless nights talking poetry, reading poetry, debating ideas and dreaming the future. Those were long nights escorted with fine wines and the newest lines some member had written. But above all, there was that halo above our heads that Harry Garuba identifies as “tortured souls poets” held hostage by “tortured sensibilities.” The poems produced by members of the group were so profoundly somber and haunting reflections on life that they could have fitted into songs for funeral processions. The greatest influence on the group was the mythmaker and towncrier at Heavensgate: Christopher Okigbo, who stood naked before Mother Idoto, a prodigal. Besides the Shadow and Dream with which Harry Garuba knitted the group together in the 1980s and early 1990s, other members who contributed to the Group’s memories include: Chiedu Ezeanah; Remi Raji; Sesan Ajayi; Afam Akeh; Frank Uche Mowah; Onookome Okome; Godwin (Amatoritsero) Ede; Emevwho Biakolo; David Diai; Sola Olorunyomi; Lolade Bamidele; Simon Berete; Nehru Ode; Franklyn Ikhinmwin, and other moonwalkers who graced the Thursdays poetry readings of the Ibadan Poetry Club and the annual Christopher Okigbo poetry festival. It was no surprise, then, that when some of us graduated from Ibadan and moved to Lagos where Nike lived for the most part of her life, our literary paths continued to cross. We met at the Association of Nigerian Authors (ANA) House in Surulere, Lagos, and even more regularly at Iya Ijebu’s Bukka in Apapa, where we held impromptu literary salons with a string of writers that included Uzor Maxim Uzoatu, Adewale Maja Pearce, Toni Kan, Obi Nwakanma, Chiedu Ezeanah, and so many others. I was the founder and Editor of The Post Express Literary Supplement (PELS) then, and later, General Secretary of ANA. I counted on Nike’s support, and she was happy to support with editing, a skill that she was so blessed with you wondered why she didn’t choose to make a living from it. Nike, had a bird’s eye view on scripts, and would enrich any copy you gave her with refreshing insights and her mastery of English syntax and grammar. Nike’s sensitivity to the feminist question was most manifest in her association with guys in what some may have seen from a tomboy-ish lens—with no pun intended. She was hardly ever defensive in the male-crowded company in which she often found herself; a measure of her success in carrying herself with dignity was in the fact that she was hardly ever disrespected. Yet, her “womanist” sensitivity was acute enough that she was an active member of Women Writers Association of Nigeria (WRITA), and indeed held an executive position. 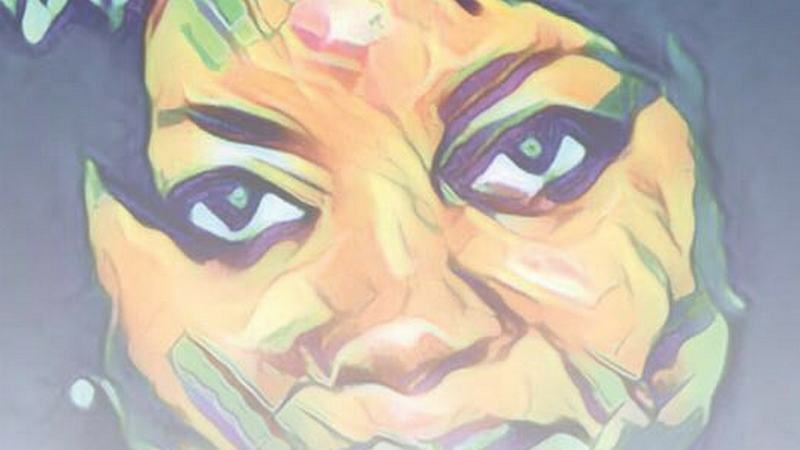 The outpouring of tributes to Nike on social media has been so remarkable that until her demise, not many people realized how deeply and how widely such a seemingly quiet and self-effacing woman had touched many hearts. In death, she is like a rock star; in life, she was a scented flower you smelt before sighting. Why diseases do not respect even the most precious bodies I do not know; oftentimes we are confronted by the sad cliche that bad things happen to good people. The news of her passing came to me from our common friend, Utibe Ukim, with whom Nike worked at Workstation, an excellent one-stop media production company that some of us have enjoyed their services. It seemed inevitable that Nike would remain in a career that required continuous challenge to the imagination. The creative arts were the veins that coursed through her body, and it was no surprise that she married another creative spirit and photographer, Amaize Ojeikere. Incidentally, it was at Workstation that Nike and I had the last and closest working relationship just before I left Nigeria for Canada in 2006 for a second life after a one-and-a-half decade career in journalism. Initially, we worked on some editions of ANA Review during my years as General Secretary of the Association; then on the publication of the anthology Camouflage: The Best of Contemporary Writing from Nigeria which I co-edited with Odoh Diego Okenyodo (published by Treasure Books, managed by the poet and journalist, Nengi Ilagha). In those instances, I experienced Nike’s loyalty to friendship and sacrifice to excellence. She would spend production nights with the production crew that included Matthias Achibong and our “boss’, Utibe. It’s hard writing a tribute to friends you have closely associated with, knowing how much their death reminds you of how the death knell perpetually tolls for you as well. Nike’s passing around the same age as I lost my precious sister Phil via the agency of Nigeria’s notorious roads and crashes, is an eloquent testimony to the transience of life. What is even more disturbing about her death is the idea that she could have had better care had she lived in a country with the appropriate medical infrastructure for citizens’ health and well-being. Birthdays should not be for dying. But our most dear friend, poet, and Workstation goddess, Adenike Adesuyi Ojeikere (1968 – 2016), left this tortured plane virtually on her birthday. Nike, forever smiling and lighting up a scene as if she were born without worries, died to create more awareness about the cold claws of Cancer in a country with little care about it. Today, we celebrate her heroic life and fight. Today, we sign her name on the leaves of fate and sing her memories to a thousand echoes from beyond. 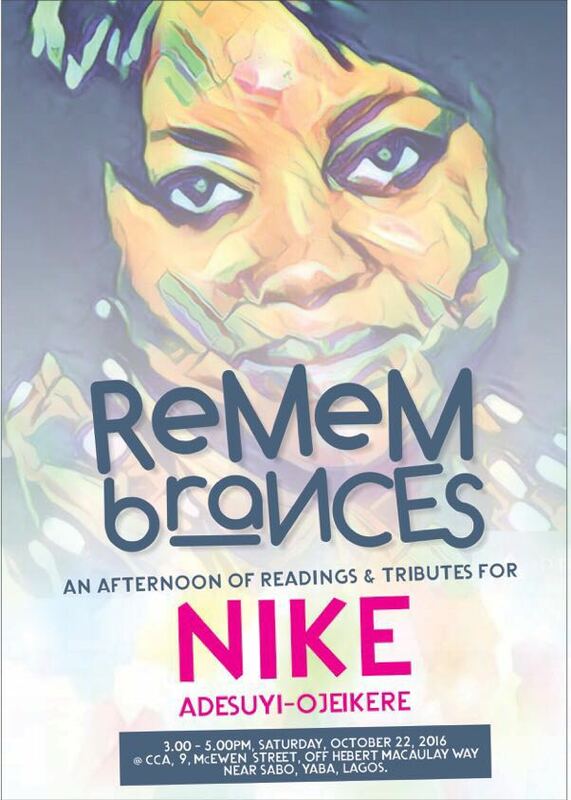 Nike may have passed on, but she lives in our tongues and hearts! In death, as in living, Nike’s voice still rings with that quiet wisdom that defines the best of humanity. Now I invoke you, Nike, as you write in the haunting lines below that I am glad I secured from you for Camouflage—given your regrettable capacity to lose your poems. Rest in Peace beautiful soul as poetry extinguishes the diseases and pains that punctuate life on our ethereal plane. Rest in peace. Now that bile smears the sun? Dye the dream, robe the shame? And Iyalaaro’s ways are a riddle to hounds. And all the winters mourn. And meaning is multiplied again. 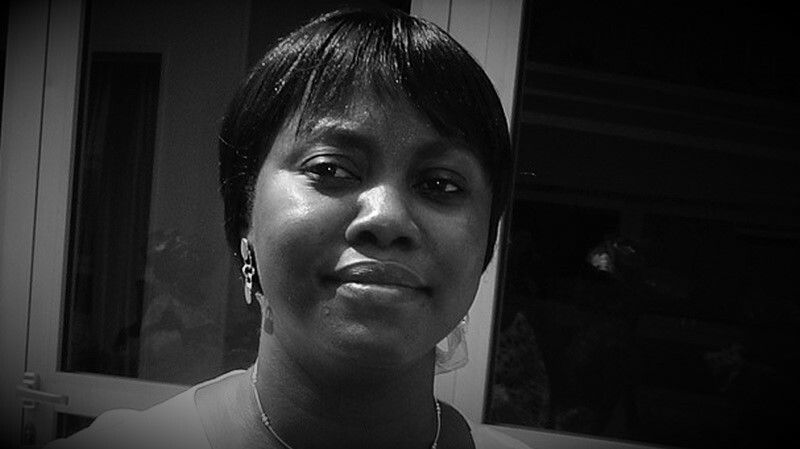 Nduka Otiono is a writer and Assistant Professor at the Institute of African Studies, Carleton University, Ottawa. He has been a journalist and General Secretary of the Association of Nigerian Authors (ANA). Among his creative writing books are: The Night Hides with a Knife (short stories), which won the ANA/Spectrum Prize for fiction; Voices in the Rainbow (Poems), a finalist for the ANA/Cadbury Poetry Prize; Love in a Time of Nightmares (Poems) for which he was awarded the James Patrick Folinsbee Memorial Scholarship in Creative Writing. Otiono has co-edited We-Men: An Anthology of Men Writing on Women (1998), and Camouflage: Best of Contemporary Writing from Nigeria (2006). The journey of life is never too far when you know what happens to those who are in the front line: They die… till it gets to you. Nike Adesuyi’s ‘The New Testament’ which I read over and over again is a well crafted statement against the ecological disaster blooming in the Niger Delta… and yet, no symposium will be held to mark her demise on the land where rabbits and fishes and clear skies, and good breath, and clean water ‘once were’. Only impoverishing oil rigs are honoured there. ‘Free Spirit’ too caught my attention as a gorgeous and a non-combatant’s approach to the tough issue: Feminism. May her poetic soul rest in Peace. May we not stop pronouncing her name and giving libation to her works. Nike; Brillant, a tour-de-force, argumentative, assertive, principled,funny… all together an amazing person. Rest In Peace Dear friend. It is well. What a soul; flying away so soon on the wings of bardic angels. Maybe God wanted her to read her poems in heaven.